Characterised by its finely grooved shell (to 40mm), this species of Nerite snail lives in association with mangrove trees (among the roots or higher up on the trunk and branches). 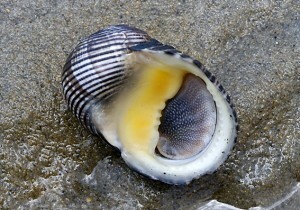 Nerites all exhibit a calcareous operculum attached to the foot. Such a structure effectively seals off the retracted animal in the shell, thereby protecting against predation. The Lined Nerite is herbivorous, feeding on algae, especially that associated with mangrove roots and trunk bases.